To publish content from Google Drive to your Content Management System (CMS), you will need to link your Google Drive and CMS accounts to Cloudpress. When you initially register with Cloudpress, the onboarding process will guide you through the process of linking these accounts. 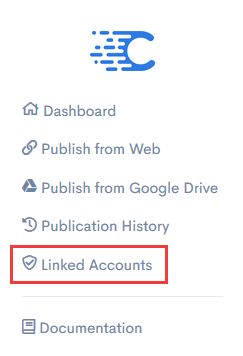 You can link extra accounts, or remove existing linked accounts from your Cloudpress account, by going to the Linked Accounts page. Linked accounts can be either a source account or a destination account. A source account is an account where you want to publish content from - for example, your Google Drive account. A destination account is an account where you want to publish content to. This is typically your Content Management System (CMS), for example, WordPress or Contentful. The workflow for registering a source account and destination account is similar, though the exact workflow will depend on the type of account you are linking. For some type of accounts, you will be redirected to the website of the relevant service to authenticate yourself and give Cloudpress access to your account. For other types of accounts, you may be required to enter our username and password or an API key for that account on the Cloudpress website. It is suggested that you review the Cloudpress documentation for the particular type of account you want to link to review the required steps and information. If you have not yet linked an account, Cloudpress will present you with a screen allowing you to link the account by clicking on the Link a … account button. In the screenshot below you can see the empty source accounts screen, giving you an option to link a Google Drive account. If you have previously linked accounts, you will see the linked accounts listed. In the screenshot below you can see the source accounts screen with an existing linked account. To link more accounts, click the Link another account dropdown. This will present you with a choice of the type of account you want to link. Proceed with linking the account by clicking on the relevant Link a … account link. You can remove a linked account by clicking on the delete icon to the right of the account name. Cloudpress keeps track of documents published from and to accounts. If you delete a linked account, Cloudpress will also remove this publication history. In this case, Cloudpress will present you with a warning, requiring you to confirm that you want to delete the account. To proceed, click the Yes, delete this account button. To cancel the deletion, click the No, do not delete this account button. Please note that Cloudpress will only delete the publication history (which can be viewed on the Publication History page) for documents published from or to this account. It will not delete the actual documents from either the source or destination accounts.